Have you got any neat ideas to share to help or hinder wildlife around your cabin / cottage? It’s a long winter so I’m dreaming fun little projects to use up scrap, repurpose things or just challenge my creativity. - For instance, lately it’s been down to nearly -30 C and I was thinking about some sort of passive solar bird roost / shelter that I could build next summer to maybe reduce bird mortality during cold snaps. (Maybe slap something together using some boards and/or scrap plywood, a curved tin reflector, some foam insulation a few 4x4 posts...) or maybe just mounting a passive solar heater ledge under the eaves of a shed. - Another thing a neighbour helped with (actually he did near everything) was installing a beaver dam levelling device. So far it’s worked great and saved our bridge from further ice damage. So now I’m wondering about other designs for when this one fails. - a big bathouse (maybe something up on 4 or more 4x4 posts). Seems that the tiny ones would be almost as much work as a supersized one. But raising a big heavy bat box up way off the ground would be a challenge. 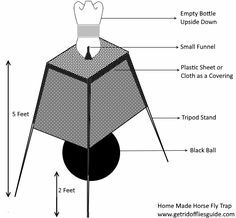 Those deer fly traps work btw. I've used them. Anything that is inverted with a clear top seems to trap them. Whether they make enough of a difference? I was never able to break that one down. Double sided tape on the back of your hat can also help with deer flies. I had the best luck with keeping nesting sites available for fly catchers tho. Meant knocking robin nests out of the barn. Mine like to be under the eaves. Enclosed on three sides. They will not come back to a nest once the babes have fledged. So if you want to encourage a second batch you need to clean the area. Feed birds high fat foods. Suet for instance. Helps them weather the cold. Anybody planning on bees this year? We have a bat house that will be going up in the spring. 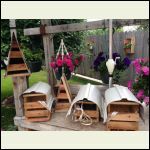 I've also been looking at designs for nesting boxes for certain critters I want around. I'm planning on flying squirrel, saw whet owl, great grey owl, and maybe wood duck boxes. Why not put up a hummingbird feeder? 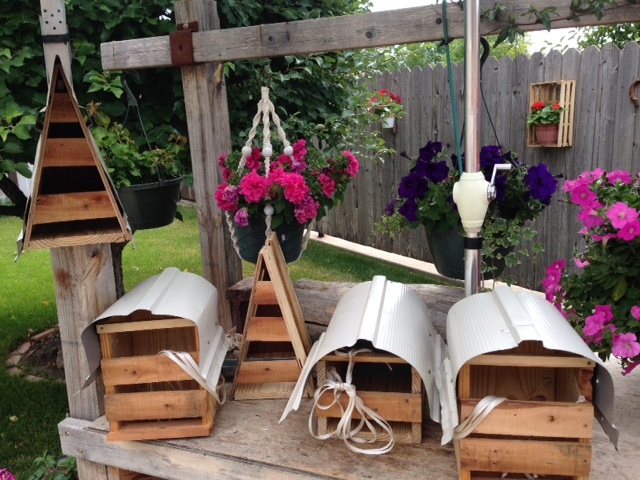 Here are a few bird houses I made from some scrape material I had. They have a tin with plenty of air flow for the variety of birds that use them. I have 4 or 5 put up all round the ranch. Bat houses, bird houses and a few the squirrels gnawed out the opening and now squirrel houses. I build bird houses. Just the standard blue bird house plan , available online. It will serve a lot of different birds, depends on the hole size you use. They are easy to make. Have a lot around my place. Also make a good cheap gift, people appreciate them.